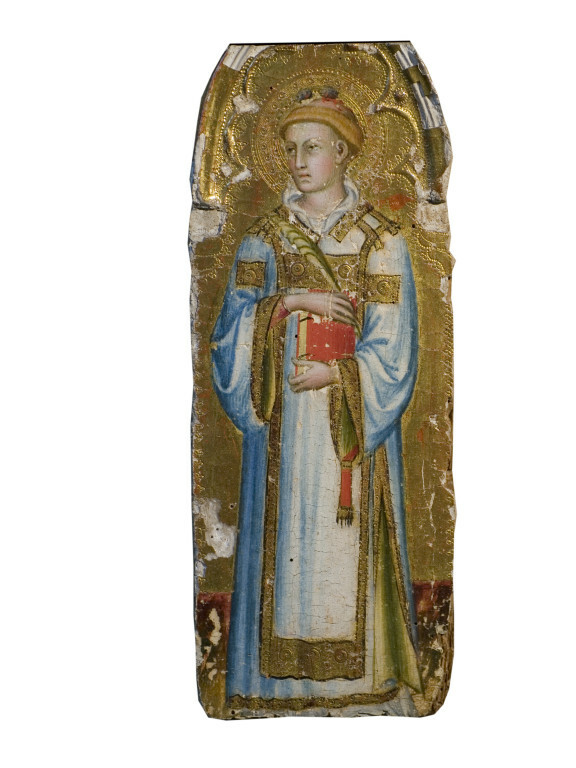 This fragmentary panel was one of a series of superimposed figures from the right pilaster of an unidentified Italian altarpiece, probably of late fourteenth century date. It shows St. Stephen with a book and a martyr's palm. The stone on his head identifies the deacon St. Stephen, the first Christian martyr, whose death by stoning is recorded in the Book of Acts (6:1-8:2). The bright tempera colours and gold background with decorative tooling are typical for the period. The painting is attributed to Andrea di Bartolo (active 1389; died 1428), one of the leading artists in Siena. The top of the arched panel has been cut off, and it has been trimmed at the bottom. The style and treatment of the gold tooling suggest that it may come from the same dispersed altarpiece as panels of St. Lucy and St. Catherine, now in the Worcester (Mass.) Art Museum. Historical significance: Andrea di Bartolo (between 1358 and 1364-1428) was a painter and illuminator who trained under his father Bartolo di Fredi. Unlike his father, Andrea employed a more summary drawing technique and softer, less emphatic modelling. In some ways, he was a more traditional painter than Bartolo di Fredi and less interested in naturalistic detail and expressionism. Andrea appears to have set up his own workshop after 1390 and soon became one of the most successful painters in Siena while also receiving prestigious commissions in the Veneto. In 1405–6 Andrea painted frescoes (destr.) in the chapel of S Vittore in Siena Cathedral, and in 1409–10 he painted several wooden sculptures for the cathedral, including St Crescentius by Francesco di Valdambrino (Siena, Mus. Opera Duomo). He also designed stained-glass windows (1410) for the sacristy of S Domenico, Siena. The four panels of SS John the Baptist, Francis, Peter and John the Evangelist, from a polyptych from S Petronilla, Siena (1413; Siena, Osservanza), are his only dated works. 371-1876 is a fragmentary panel from a series of superimposed figures from the right pilaster (as suggested by the direction of the saint's gaze) of a polyptych. 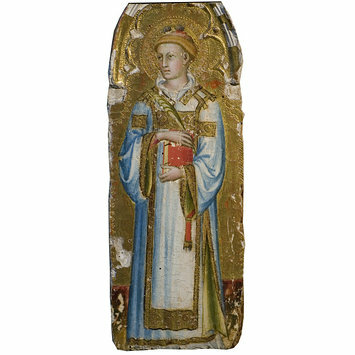 St. Stephen is depicted with a book and martyr's palm. The stones on his head refer to his role as the first Christian martyr, whose death by stoning is recorded in the Book of Acts (6:1-8:2). The top of the arched panel has been cut off, and it has been trimmed at the bottom. The style and treatment of the gold tooling suggest that it may come from the same dispersed altarpiece as panels of St. Lucy and St. Catherine, now in the Worcester (Mass.) Art Museum (1940.31a; 1949.31b). An altarpiece is an image-bearing structure set on the rear part of the altar, and which normally declares to which saint or mystery the altar was dedicated. Its form and content customarily evoke the mystery or personage whose cult was celebrated at the altar. Altarpiece forms vary enormously, and may include movable statues, relics and sacrament tabernacles among other elements. The original association of the Christian altar was with the tomb of a saint, and theologically with the tomb of Christ. Altarpieces adorned both high altars and side altars. High altars often carried large altarpieces with elaborate programmes while side altars served a more private piety and their altarpieces were often endowed by private individuals. In Italy, the altar became a primary setting for painting on panel, a format developed in the West from the example of Byzantine icons. An early format, consisting of gabled panels in a vertical format representing a full-length saint flanked by scenes of his or her life, soon developed to include an elaborate gabled outer structure enframing several vertically conceived individual compartments to form a Polyptych. Polyptychs were increasingly elaborate, their frames often featuring piers, colonettes, cusped arches, tracery, pinnacles, crockets and finials, eventually transforming the altarpiece into an architectonic structure resembling in detail and spatial principles the façades of contemporary full-scale Gothic architecture. Bernhard Berenson, The central Italian painters of the renaissance 2d ed., rev. and enl. New York, London, G. P. Putnam's sons [c1909], p. 140. Raimond van Marle, The development of the Italian schools of painting The Hague : M. Nijhoff, vol. ii, 1924, p. 542, n. 2. Raimond van Marle, 'Alcuni dipinit ignoti.. di Paolo di Giovanni Fei' in La Diana iii, 1928, p. 289. Bernhard Berenson, Italian pictures of the renaissance Oxford : Clarendon Press, 1932, p. 9. Bernhard Berenson, Pitture italiane del rinascimento; catalogo dei principali artisti e delle loro opere, con un indice dei luoghi (traduzione italiana di Emilio Cecchi). Milano, U. Hoepli , p. 8. Bernhard Berenson, Italian pictures of the Renaissance : a list of the principal artists and their works with an index of places. Central Italian and North Italian schools. (London : Phaidon, 1968), vol. i. p. 7. European paintings in the collection of the Worcester Art Museum. (Worcester, Massachusetts: University of Massachusetts Press, 1974), p. 309.